Though I can refer you to a website that again will always have better pictures than me, I did remember to photograph this one. We made it…This time we substituted some frozen ham we had instead of bacon. We always saute an onion and some garlic in the bacon drippings/oil before adding the flour. This time we used Italian seasoning because we were out of thyme and it worked well. 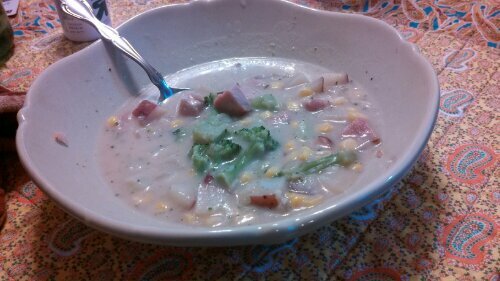 I usually take my 4 cup liquid measure and add 1 1/2 cups of frozen corn and then top it off with frozen broccoli because we like our soups thicker. Also Chris love broccoli. We ate it…6 servings/3 meals for us. We thought…The fact that this uses frozen vegetables helps a lot. It means it can be made easily or shuffled around if changes plan without the fresh ingredients going bad. Overall, a really great staple soup. It also scales up well – we’ve made tons of it at a time for a big group before.